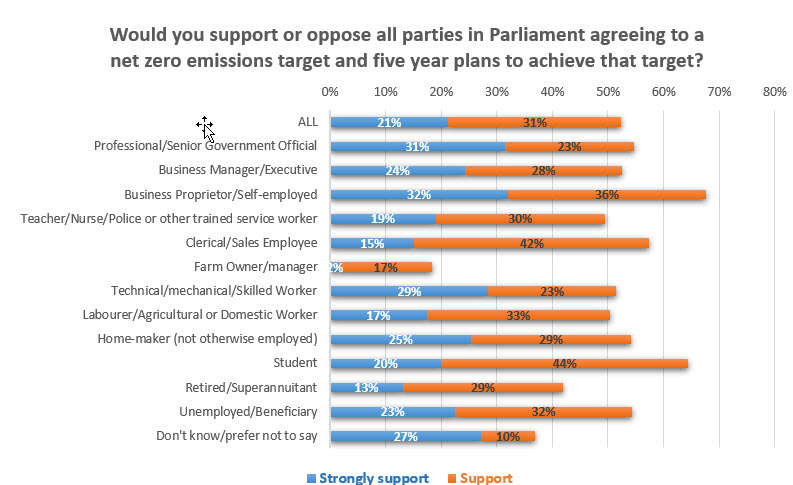 A majority of New Zealanders support all parties in Parliament agreeing on plans to act on climate change. 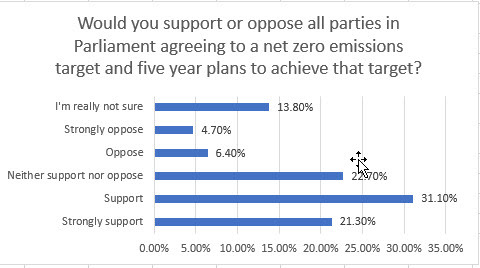 52% (around 1.66 million adults) support all parties in Parliament agreeing to a net zero emissions target and five-year plans to achieve that target, a Horizon Research poll finds. 11% oppose, 22% are neutral and 14% say they are really not sure. Business organisations are reported as calling for multi-party agreement and climate Change Minister James Shaw this month invited the National party to work with the government on the issue. National’s leader, Simon Bridges, has since announced has written to the Prime Minister offering to work together on climate change policy, subject to some conditions. 52.5% of business managers and executives and 68% of business proprietors and self-employed support all parties agreeing to a net zero emissions target and five yearly plans to achieve it. The Zero Carbon Bill was introduced to Parliament after the survey was conducted. Appoint an independent Climate Commission to guide the transition. The Government has already announced it will set a target to reduce the country’s greenhouse gas (carbon) emissions to net zero by 2050. This is also known as “carbon neutrality”. The Government says that to achieve net zero carbon emissions, we must reduce our carbon emissions to a level that is balanced out by carbon stored in forests and other carbon sinks. The Horizon surveyed 1,164 respondents aged 18+ nationwide between March 20 and 27, 2018. Quota sampling and weighting were used to achieve a representative sample the adult population at the last census. At a 95% confidence level, the maximum overall margin of error is +/- 2.9%. An earlier result found New Zealanders’ concerns over climate change at their highest level in 10 years. You are welcome to have your say on this at our Facebook page.